This warming, satisfying and delicious instant pot chili with ground beef will make you ask for more! Healthy instant pot dish that even your kids will love. In the last month a posted so many Instant Pot recipes, that it looks like its all we eat… which is almost true. 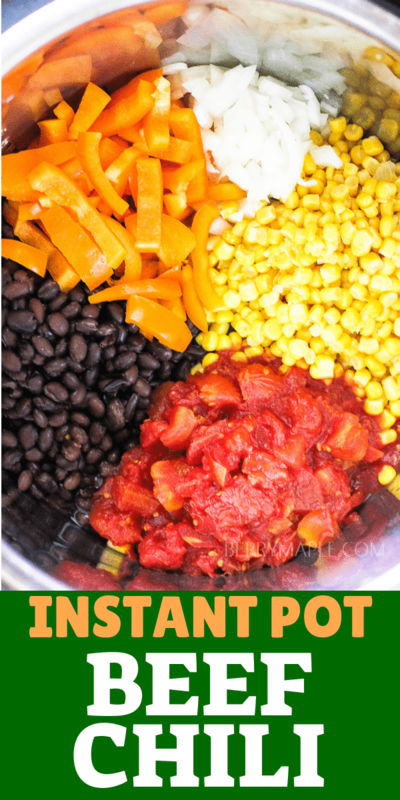 Instant pot saves me a lot of time, which is so important when you are a mom of young kids. Busy all day, running around, trying to clean, cook, deal with crying and screaming, drive all over and be happy at the same time. Ouch. Instant Pot helps me to cut my cooking time in half (sometimes even in five times, like here, in Caldo de Res in Instant Pot recipe). So, back to the instant pot chili recipe. I cooked it with frozen ground beef from Costco. You know, that one you buy already frozen and blocks. 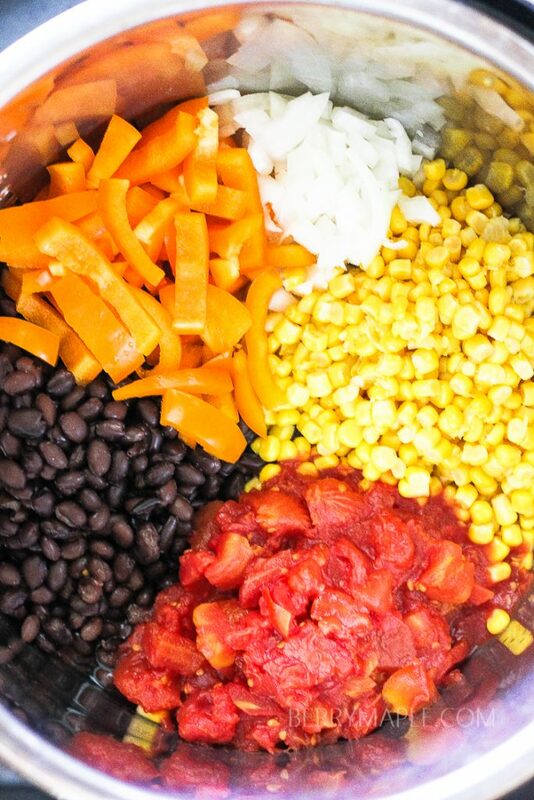 Dump all the ingredients in to the pot, close the lid, turn on —> 40 minutes after here you have an amazing flavorful chili, no babysitting required ! (see notes for frozen and fresh meat directions). 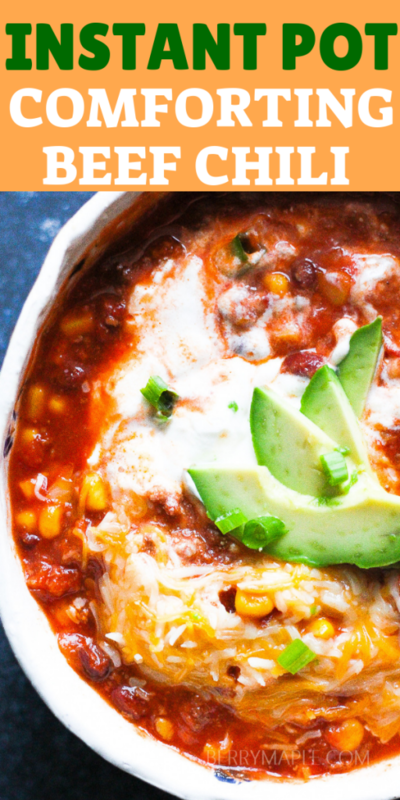 This warming, satisfying and delicious instant pot chili will make you ask for more! Very easy! Just dump everything in to the pot, stir, close the lid and set the timer for 35 minutes on CHILI SETTING . When frozen meat is used, one more action will be required after cooking. The meat will be cooked in one block, so after you will have to crumble it with a spatula. Is your nutritional info per serving or the whole pot? It’s coming up as 12 WeightWatchers points, and that seems high. I love my IP! Thanks for the recipe- using a few different ingredients -too snowy to go to the store! OOPS! Hubby just came in and said, “Why is the IP on venting? !” I corrected that problem! Luckily, its only been on for about 5 minutes! Why do I mention this? Because the IP is forgiving, as long as you catch that mistake early enough, wouldn’t you agree, Tatiana? Can’t wait to try my chili! And I do have all the other fixins! Always have my avocados on hand for Keto lifestyle! bon appetit! Do you drain the beans/corn first? Looks good but scares me as I have had problems with recipes with tomato sauces. So, what is my goal? Not to mix ingredients? To try and keep the broth on top to produce steam? Or to move things so the water gets to the bottom to keep things from burning? I have not mastered this type of cooking in the IP yet, so any advice you can give me would be most welcome. Thank you! This recipe calls for 2 cups of broth as well, so don’t worry! Just mix all the ingredients and cook, it should be ok. I recently discovered smoked paprika and it has drastically changed my cooking! This looks so good. This looks ABSOLUTELY delicious!! I’m going to have to make this soon! I LOVE chili! Sharing this recipe with my mom. I’m sure she will love it. I have been craving chili lately!! This looks amazing!! 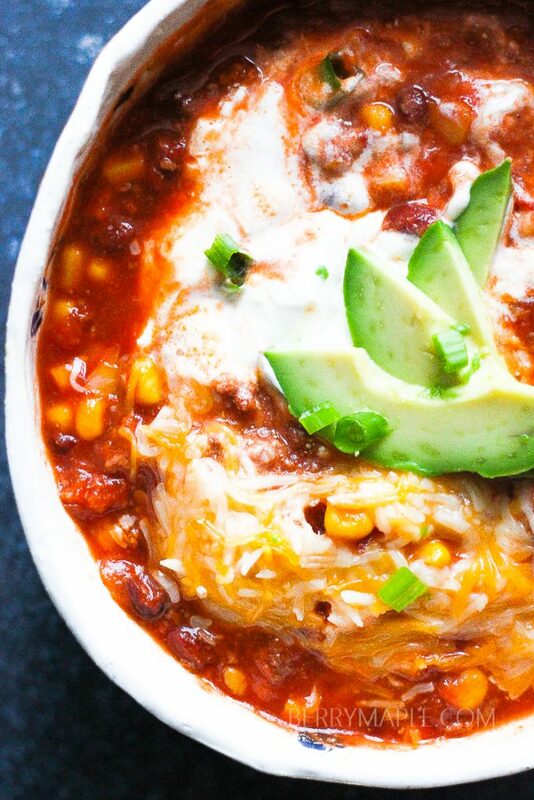 This is one of the easiest recipes I’ve ever seen for chili. That bowl looks like it’s calling my name! I love your addition of avocado on top, takes it to a whole new level! I love recipes that you can just throw in and walk away from. So perfect like you said when you have toddlers to entertain! What an awesome easy recipe! I love that I can just dump it all in and in less than 40 minutes, I will have a great dinner! I’m a sucker for a good chili and the instant pot makes this even better! Can’t wait to try. I just made chili in my instant pot for the first time last week but mine was quite different than this. It was “throw everything in and see what happens.” Can’t wait to try this recipe. It looks SO good. I just got an instant pot and I’m on the hunt for good recipes. 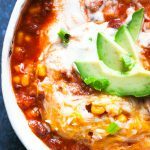 Chili is one of our favorites to make this time of year so I’m definitely going to give this recipe a try! alright, tasty recipes like this, so easily prepared are going to have me final jump on the Instapot train! 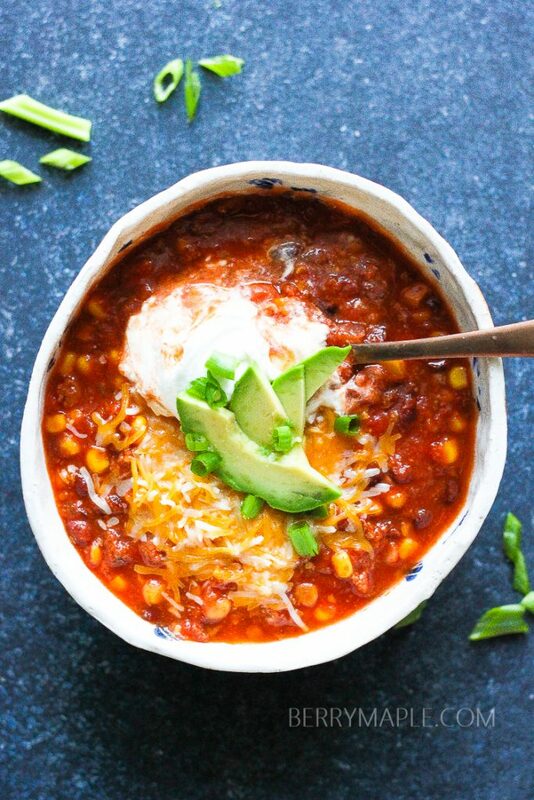 This instant pot chili looks so awesome and love how easy it is! I still don’t have an Instant Pot! But my mom loves hers- what a great idea to use it for a chili that would usually simmer for a long time! 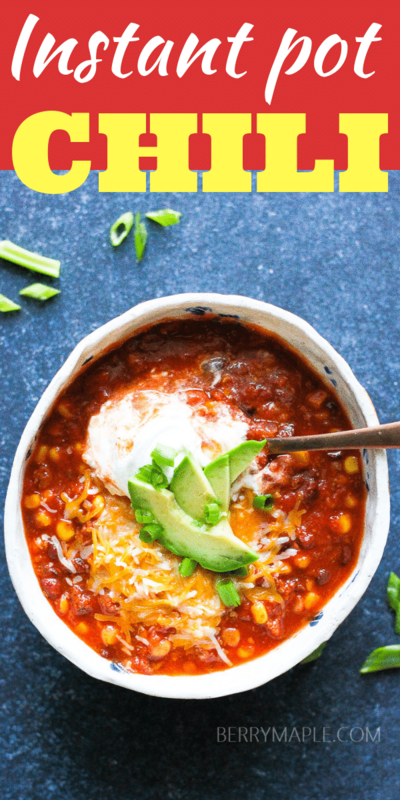 I’ve never topped chili with avocado before, this is a game changer ! Thanks for the recipe, I’ll take any excuse I can get to us my instant pot !